Our goal is to provide you with exactly the tabs you want at the very best price. Order yours now! What different types of cuts do you have for your tabs? What is the difference between courtfolio tabs and AV tabs? AV Tabs:: 25th cut white side tabs that have numbers in a sequence of 25 tabs. These tabs have the same number on both sides of tab. Each group of 25 numbers is considered a set. These tabs are available only in white. Order as sets of 1-25 up to 600. Also available in individual packages numbers 1-35 with 25 sheets of the same # in each package. Sets can be used both bottom to top and top to bottom. These are sold by the set. Courtfolio Tabs:: 20th Cut, numbered in incriments of 20 and are packaged only in sets. The numbers are reversed numbered so you can take number 11-20 in a set of 1-20 and turn it over to have two sets of 1-10. These tabs come in several different colors such as Green, Blue, Red, Yellow, Amber and White. You also have the choice of top to bottom tabs (where the number 1 is at the top of the page) or bottom to top tabs for pleadings (where the number 1 is at the bottom of the page). We also carry this item for the left side of your folders and in smaller sets of 1-5. Individual numbers are not available for these tabs. The numbers can run up to number 500 in certain colors. 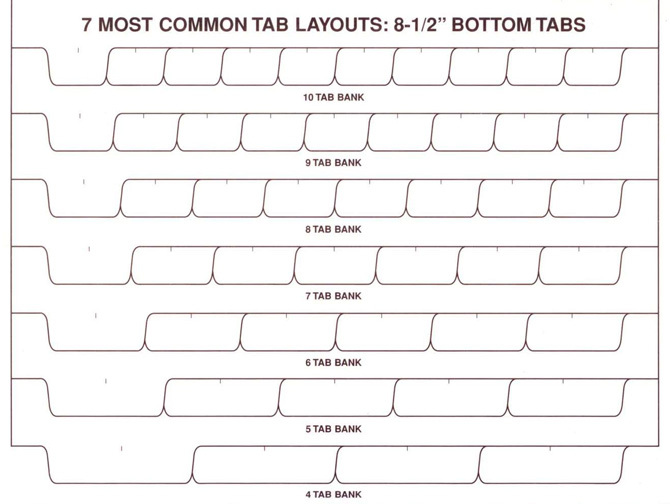 Left side tabs should reference are only available in the bottom to top style. All Courtfolio tabs are packaged with 5 sets per package. Do all Courtfolio Tab numbering sequences come in all colors? Colors available include Clear, Amber, Blue, Red, Yellow and Green. Colors available include White, Amber, Blue, Red, Yellow and Green. What is the difference between 10th cut exhibits and 5th cut exhibits? 1) A 5th cut exhibit is only available with the tab on the bottom. 2) A 5th cut exhibit is sold only in individual packs of 25 sheets of the same letter or number, no sets of running number or letters are available. 3) A 5th cut exhibit has the same letter/number on both sides of the tab. 4) A 5th cut exhibit is larger and fits 5 tabs all the way across the bottom before starting a new "bank". Behind the number 1, number 6 would be placed or behind letter A, letter F would be placed. 5) 5th cut exhibits are only available in the numbers 1-25 and the letters A-Z. 6) 10th cut exhibits are sold both in individual packages (for the first 10 letters or numbers ONLY) and in sets of running numbers and letters in increments of 10. 7) 10th cut exhibits are reversed numbered/lettered and have an opposite letter or number on the back sides of each tab. 8) 10th cut exhibits are available both on the side and the bottom and come with either yellow or white tabs. 9) 10th cut exhibits are available in numbers on the bottom up to 100 in white or up to 40 in yellow and on the side the numbers can run up to 50 in white and 70 in yellow. The letters on the bottom run from A-DD in both white and yellow and the side also runs from A - DD in both white and yellow. 10) 10th cut side packages automatically come with a table of contents page and the bottom tabs will not include a table of contents page unless requested for an additional .20 cents per set. 11) 10th cut exhibit sets are purchased in incriments of 10 per set. The individual packages have 25 sheets of the same number or letter. What are the sizes of paper you use? We only carry letter size: 8 1/2" x 11"
10th Cut Bottom Tabs - A-J Discounts Apply ! 1-49 sets: $1.95 ea. 50-99 sets: $1.84 ea. 100+ sets: $1.76 ea. **All products sold by Legal Dimensions are made with 30% recycled paper. Copyright © 2018 Legal Dimensions. All rights reserved.